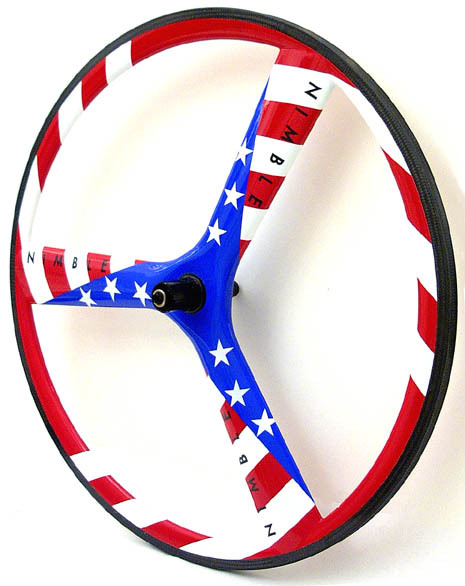 The USA stars and stripes is a special decoration option available for the Nimble CROSSWIND. It was created for the 2000 Olympics in Sydney where Nimble wheels were used in at least 10 of the cycling related events including the women's and men's triathlon, the cycling road race, road time trial and several cycling track events. It is also a choice of several US national champions. 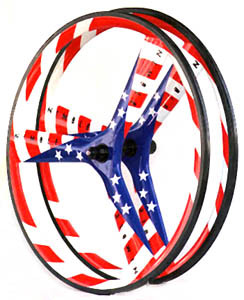 The decoration adds approximately 30 grams per wheel. CROSSWIND is available in several specialty paint colors. Standard solid colors are: Red, Periwinkle, Mango and White for $220/set upgrade. Custom solid colors to match anything are $50 extra. Custom special work is available by quote. 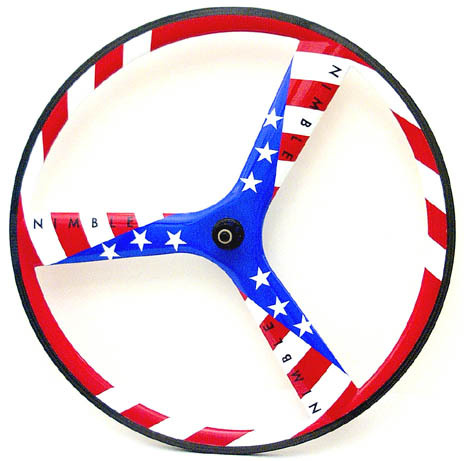 USA custom colors are $520/set. Availability ranges from immediate to 8 weeks. Also see CROSSWIND, see paint options and pricing. Pictured left is the wheelset used by Jennifer Gutierrez in the 2000 Olympics for the Women's triathlon. Also see CROSSWIND, see paint options and pricing. 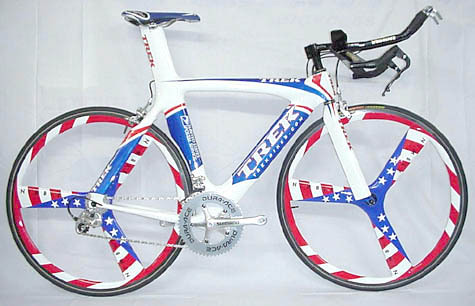 Pictured above, George Panarello's USA display bike.